It's been over two years since Intel unveiled its Curie chipset — a small module specifically designed for wearable devices like smartwatches, smartglasses and everything in between. Slowly but surely, it's been creeping into more wearables, but with Intel increasingly branching out to partner with startups, and not just the big hitters of the tech space, we wanted to find out exactly what is going on with Curie and the chipset maker's wearable ambitions. From adrenaline sensing dresses to luxury smartwatches, here's the story so far and what could be next. When a new device is first unveiled, you're bombarded with a bevy of specs. If it's a smartwatch, for example, there'll be measurement details, screen type, battery size and, of course, which sensors are crammed underneath the face. But the key player is the processor and the system-on-a-chip (SoC) — in this case, Intel's Curie module. The technology is small enough to fit into a button, using the Intel Quark SE (SOC) that integrates the power of a full-sized computer into a single chip. It's what brings the software you see on screen and the hardware performing the actions together as one. Think of it as some kind of bizarro tech matchmaker. But, of course, Intel isn't the only one producing these modules specifically for wearable devices. Chipset kingpin Qualcomm has been a part of countless devices, too, since introducing its Snapdragon Wear processors to the space - particularly in Android Wear smartwatches. You also have the likes of Apple and Samsung, who pull in parts from across the tech world and brand a chip as their own. But while Qualcomm is used inside a smorgasbord of wearable devices, it's been Intel which has recently leapt into the startup and crowdfunding space — where many burgeoning wearables and innovations take place. After allowing Intel to run the show in its first generation smartwatch, luxury brand Tag Heuer again used the smarts of the company to power its Tag Heuer Connected Modular 45, released back in March. This time it's using Intel's Curie platform and its Atom processor Z34XX — one that's actually used in phones — while 512MB of RAM and 4GB of internal storage are also in tow. Through our time with the device, we found the company's first dip into the Android Wear 2.0 experience to be a slick and zippy one. The dinky little chips have found their way on the catwalk as well having made their presence felt at NYFW and Paris Fashion Week over the last couple of years. Like the Adrenaline dress (above) designed by Hollywood costume designers Chromat. Then there were the activity tracking emoji pins that were handed out to "select fashion influencers" at last year's show. The pins also were able to track steps, activity and location. Unfortunately, it doesn't look like you can buy this pins and are more proof of concepts at this stage. We've also written about smart bras in the past as well, but again, we've yet to see anything that you can actually pick up out of a shop. While technically operating as smartglasses, Oakley's Radar Pace lenses are really more of a hearable, allowing exercisers to be coached in real-time thanks to the help of Intel's Curie tech. The goal here was to create an AI coach that could be more conversational and contextual than other personal assistants, where chat can often be stilted, and to that end this partnership works admirably. And what's more, the glasses are able to learn your habits over time, thanks to the module. 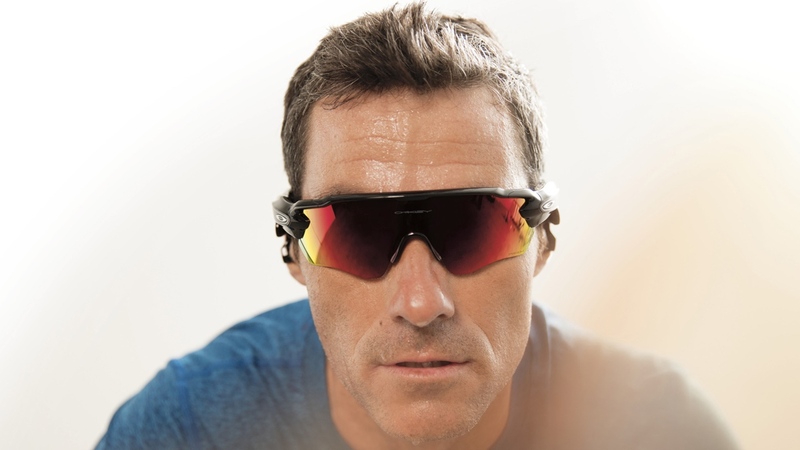 Have a read our Oakley Radar Pace review to see whether we were big fans of the hearable. Startup company Shft partnered with Intel to bring real-time AI coaching to its second generation running pod, Shft IQ, successfully completing campaigns on two crowdfunding platforms ahead of its launch later this year. When we spoke to CEO Tony Motzfeldt about the integration, he indicated that the decision to create a smarter wearable was down to the advanced smarts the module would bring to its running wearable. "We've been working with Intel for around eight months, and we're using the new Curie chipset with the artificial intelligence built into it. This will help Shft analyse things like your gait and tell you more about it in real time," he said back in March. While many sports have embraced the wearable tech space, cricket has only recently managed to get itself into the mix, and it's doing so with the help of Curie. Startup Specular has created BatSense, a puck which fits onto the top of bats, using Curie to give broadcasters and fans an insight into data such as bat speed, impact angles and backlift motion. The device first debuted during the ICC Champions Trophy, with a select group of players from each nation adopting the tech, but it's also set to become available to consumers in August. There's certainly not been the kind of wearable explosion that Intel perhaps expected when it first announced Curie. Tag Heuer smartwatches and Oakley's Radar Pace aside, the wearables powering the tech you can actually get your hands right now is still small in number. Two years on it still feels like there's a whole lot of experimenting going on as interested developers seek to see what is possible with the tech and the kind of scenarios it can bring value to. We know that Intel is using Curie to build a smartwatch assistant that's landing on Tag Heuer smartwatches later this year before being adopted by other devices as well and could see Intel enter the space that's already pretty crowded with Amazon, Google and soon Apple all wanting a piece of the virtual assistant action. There's no doubting that Curie is being embraced in interesting ways, now the hope is that more of those wearables become available to the masses.